Redmond Gary manufactures products in many areas such as drum stands, winches, trailers, pole borers, etc. Our company offers two separate models of our cable pusher machine. They are both powered by diesel engines or electric motor, as you can see below in descriptions. Should our clients require, there is an option to include additional cable benders into the product package. Both of the cables have adjustable jaws which means they can operate with cables up to 200 mm in diameter. The design is compact and practical, the machine can be easily transported on site and has everything it needs for operating as an independent unit. 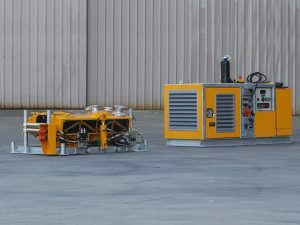 The cable pusher machine only needs one man in order to operate it, therefore there is no need for an additional crew member. The purpose of these machines is industrial cable handling. Mounting or manipulating industrial cables with a significant amount of weight and length would be impossible without a cable pusher. 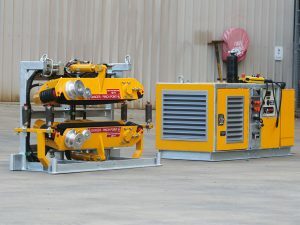 The cable reel pusher can be controlled by a pendant which is attached to the machine by a cable which is 5 metres long. This allows the crew member to be at a safe distance and avoid any possible injuries while operating. They consist of two main parts, the cable pusher which holds the logic board and the power pack. The power pack only provides electricity and hydraulic power for the electric cable pusher. This makes it a robust and portable design. Redmond Gary has been in the field for more than 18 years and manufactures more than just cable pushers for sale. Cables are essential for today’s world needs for communication and electricity distribution. The first cable that was installed in Australian waters was back in 1859. The cable was, however, quickly abandoned from use, due to its wear against sea bed rocks. Later in 1870s the electric telephone was invented and the need for cables and building bigger commercial networks increased significantly. The first commercial telephone set up occurred between the years of 1878 and 1879 on both sides of the Atlantic. The line was laid from New Haven in Connecticut, USA to London in England. The first intercontinental telephone call occurred on January 25th in 1915. This was 25 years after the discovery of the electric telephone itself. It was quite an achievement to put a line across the Atlantic Ocean, but 25 years is a lot of time. This can be probably explained by the fact that at that time, over 100 years ago, the equipment required had not even been invented, let alone exist. Even when the first transcontinental call was made, the line was unavailable for commercial use until Jan 7th, 1927. In the 1950s, cable TV was also a new and fast-growing business. The number of cable subscribers grew from just 14,000 to 850,000 in a period of just a few years. The second half of 21st century also witnessed the rise of computing technology. With such improvements and with such a quick rate of growth, computer networks became an inevitable and a revolutionary discovery. With all of this advancement in communication and distribution networks a new field of development arises. Back in 1964, Charles Kao and George Hockham opened the door for Alexander Graham Bell who held the patent for creating the first telephone. The predecessor of the Internet, ARPANET was constructed in 1969. The first data passed between the nodes of this network and marked the beginnings of the development of the Internet. The first modern-era mobile telephone was designed in 1973, the time for battery recharging was 1 year. And the time-limit of the call was only 30 minutes. In 1983 the Internet officially came to life and the communications system now called TCP/IP, became the standard for data transmission. In 1998 the first communications canopy, consisting of 64 satellites was put into use. The company that created the network also produced the first hand-held satellite phones. They were significantly smaller than their ancestors. VoIP Internet telephony was introduced in 2003 as telephone calls could officially be transmitted through already existing and well-established computer networks. Based on this development, the communications world well known to people today relies and exists on networking and distribution, mostly through cables. Communications is only one side of the world’s cabling requirements, electrical power is also distributed through cables, to just about every home and business in the developed world: a massive undertaking requiring the running of cables above and below ground, beneath the ocean and down every street. This field of manufacturing and designing products to build and maintain these networks is an extensive task that requires discipline and precision. How Does Redmond Gary Fit in This? Redmond Gary is a specialized manufacturer for electricity distribution and telecommunications cable handling and running equipment throughout New Zealand and Australia. We produce a wide range of equipment including pole borers, trailers, drum stands, winches, cable pushers, EWP’s (Elevating Work Platform) and MEWP’s (Mobile Elevating Work Platform). We have earned a healthy reputation for supplying top-quality products in this area of business. Wherever an underground or overhead installation of cables is in process, you are likely to find a Redmond Gary product in use. All of our products are proudly designed and manufactured by our staff in Australia. The manufacturing plant rests on 6000 square-feet of land, equipped with up-to-date equipment and highly trained and qualified staff. We also manufacture the spare parts for our products and we offer training for safe and efficient operations with our products. The training is usually carried out in groups of 3-4 people, this allows the quality of the training to be on a higher level. All of the trainees receive practical training as well as theoretical training, including Risk Assessment. After a successful completion of the training, all of the trainees receive an RG Redmond certificate. Spare parts are in stock for all of the essential items required by Redmond Gary’s products. When ordering you will be asked to provide additional information about your product. VIN (Vehicle Identification Number) – this only applies for products that are trailer-mounted. Our clients include major electricity authorities, private contractors and mining companies. The products we design are built to function perfectly in Australia’s tough conditions. Our highly experienced mechanical and electrical engineers make sure that the products Redmond Gary produce meet or exceed the requirements of Australian Standards, while for safety we comply with International Standards. All of the products we provide, cable pushers included, function on electricity and hydraulic pressure drives. Please also note that our staff will make major changes that could affect the machinery’s operation procedures only if the client allows it. Important notice: All products include one copy of the relevant Operations Manual that contains assembly drawings, hydraulic and electrical schematics, operating instructions and other relevant data about the product. Additional copies of the Operations Manual can be obtained for a very small fee. See some of our cable pushers in action on the following link. Have additional questions or concerns? Feel free to reach us here via mail or phone.